Awesome Megabundles being offered on Black Friday from Dark Horse! 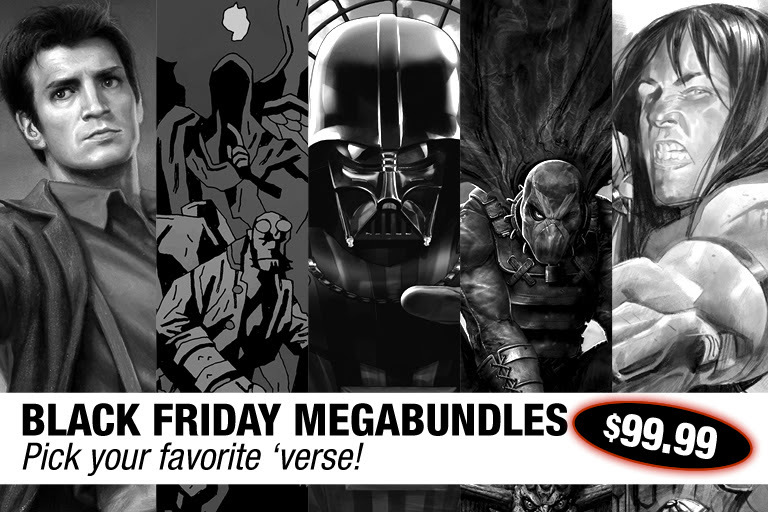 Starting Thanksgiving, Dark Horse Digital will offer six MegaBundles of comics & graphic novels for $99.99 each! Thousands of pages of comics over 60% off! November 21, MILWAUKIE, OR—Dark Horse Comics is rocking Black Friday madness with a very exclusive limited offer for its digital-comics readers . . .
Feast your eyes on this year’s Black Friday MegaBundles. For one weekend only, you can load up on comics from your favorite creative universes for the crazy-low price of $99.99 each only on Digital.Darkhorse.com! This year we are giving Star Wars fans two different options! Get 200 digital Star Wars comics or get everyStar Wars Omnibus. Purchase these MegaBundles, you should. Too late will it be if you wait! Joss Whedon has created some of our favorite worlds to play in. Buffy the Vampire Slayer, Angel & Faith,Serenity, Dollhouse, and even Dr. Horrible are all included in this limited time MegaBundle. Dive into creator Mike Mignola’s dark worlds. Hellboy, B.P.R.D., Baltimore, Witchfinder and evenSledgehammer 44 are all included in this limited time MegaBundle. Acclaimed writer Robert E. Howard created worlds of adventure. Conan, Kull, and Solomon Kane are all included in this limited time MegaBundle. Jump into Dark Horse’s superhero universe, Project Black Sky. Ghost, X, Captain Midnight, Skyman, The Occultist, and Brain Boy are all included in this limited time MegaBundle. Having launched with hundreds of titles, Dark Horse Digital offers its most popular titles at an unprecedented value, while providing the highest-quality reading experience possible. Single-issue comics are priced as low as just $0.99, and there is also an extensive list of free introductory #1 issues. Additionally, DH Digital’s “bundles” group together story arcs spanning multiple issues into affordable packages, allowing readers to get the three or four issues that comprise a complete narrative, starting at just $3.99 and up. And through cloud-based technology, Digital Store purchases can be read and enjoyed on your laptop, desktop, mobile browser, and Dark Horse Bookshelf app, available now on the iTunes App Store and Google Play..